How do I measure “clear and colorless” Surfactants? Surfactants reduce the surface tension of a liquid as in the use of a dish detergent; the interfacial tensions between two liquids such as in the case of an oil spill in water, or of laundry detergent removing soil from clothes in water. Surfactants have two parts within a single molecular structure – a hydrophilic (or water-loving) head and a hydrophobic (water-repellent or oil-loving) tail. The hydrophobic part is typically a long hydrocarbon chain of different types. The polar hydrophilic head group can be non-ionic (no-charge), anionic (positive charge), cationic (negative charge) and zwitterionic (two opposite charges). In terms of color and appearance quality, transparent surfactants are often visually described in product specification sheets as “clear and colorless”, almost “water white”, without apparent visual haze. “Colorless” in measurement terms, means being a close as possible to distilled water with only trace yellowness. Being “clear” means being as close to distilled water as possible in not scattering light. Any of HunterLab’s diffuse d/8° sphere instruments such as ColorQuest XE, UltraScan VIS or UltraScan PRO are appropriate for this application. Additional required accessories are a 50 mm path length transmittance cell (13-8573-20 or 20 mm path length cell ( 04-4592-00) and a Transmittance Cell Holder (C02-1005-481). CIE L*, a*, b* D65/10° or C/2° as a full color descriptor. While these values are good to report, APHA and Haze% will be the two metrics best able to distinguish slight lot differences in very clear and colorless surfactants. APHA-50 mm [C/2°] or Yellowness Index YI E313 [C/2°] to quantify trace yellowness.Typical purchase specifications indicate a maximum APHA value of 5 to 30, with distilled water being 0. Haze% to measure trace scattering to indicate how “clear” the sample is. DI water will have 0% haze. A visual difference in haze can typically be seen around 4%. As an optional metric, Y Total Transmittance can be configured to quantify the total amount of light passing through the sample with DI water as a reference for 100% transmittance. The Light Blocker to set 0% transmittance. The 50-mm path length transmittance cell filled with DI water and the white calibrated tile at the reflectance port to set 100% transmittance. As a recommended PQ (Performance Qualification) step, leave the cell with DI water in place at the TTRAN port. Then measure DI water as a product standard. If the instrument is set up correctly, distilled water in the 50 mm cell should measure closely to CIE L* = 100.0, a* = 0.0, b* = 0.0; APHA = 0.0; YI E313 [C/2] = 0.0; Haze% = 0.0 and Y Total Transmittance = 100.0. As an optional Application Diagnostic step, a liquid APHA Color standard can be purchased with nominal values similar to the product specification (APHA 5, 10, 20 or 30), then measured for APHA 50-mm and Haze% on the first day to establish baseline values. The measured baseline APHA value should closely match the assigned APHA value for the standard. The baseline Haze% should be low, typically < 1%. 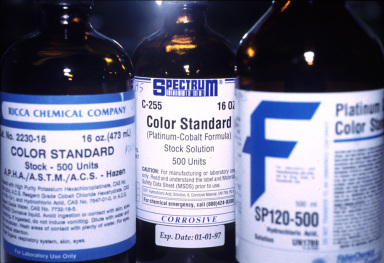 Measurements of the APHA liquid color standard should match the baseline values closely over time to affirm that your instrument is consistent in measuring APHA Color and Haze%. Proceed to measure batch lots of surfactants and report APHA and Haze% to document process differences by lot and conformance to product color and appearance specifications. What Path Length Cell should I use for APHA/Pt-Co/Hazen Color Measurement?